We’ve had so much fun thinking about Christmas party outfits over the last few weeks! When looking to up the sparkle factor there’s really no need to mess about - head straight for the rhinestones! This year, I’ve been coveting a sparkly, twirly skirt for festive get-togethers. 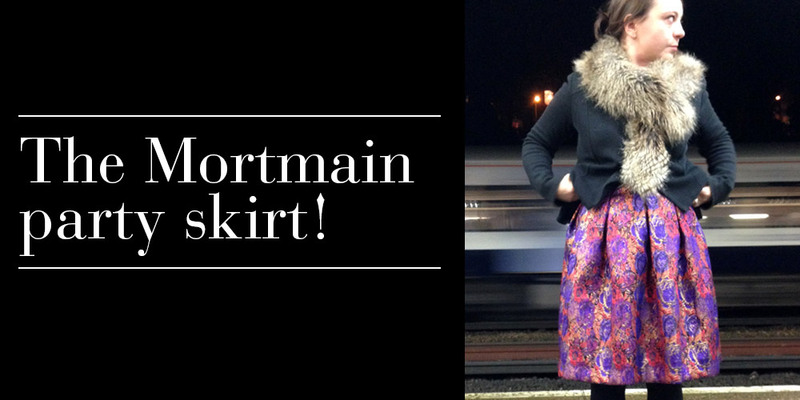 Having found some irresistible fabric, I thought a hack of The Mortmain dress into a skirt was just the thing. Add a lining, and you’ve got a luxe, bespoke skirt that’ll get you in the party mood. Planning your party outfit is one of the most fun parts of Christmas season - all the more so if you’re making it yourself! We’ve rounded up just a few of the ideas that we’ve had for our virtual Christmas party - new makes, up-cycles, and DIY embellishments galore. Which to choose! When it comes to sourcing sparkle, Laura Stanford knows her stuff. As co-author of the fabulous new book The Secrets of Sewing Lingerie, she (and fellow author Katherine Sheers) is a professional when it comes to using luxurious and delicate fabrics. Where better to turn for advice on where to find something a bit special to glam up your party outfit! So, we’ve told you what a fantastic haul we have up for grabs for the Best Party Outfit category. Today we’re going to round up the goodies for the winner of the Best Party Accessory category, and it’s another covetable selection of sewing loveliness! What do points mean? Prizes! So, we’ve invited you all to our virtual Christmas party, explained how to enter our competition, now we should really cut to the chase and tell you what fabulous goodies we have up for grabs. And let me tell you, these are some blimmin’ great prizes! We’re having a virtual christmas party! On Wednesday 10th December we’re having a virtual Christmas party and you’re all invited!